c. Write the importance of power protection device to protect the computer system. d. What is computer virus? Mention any two symptoms that can be seen when a computer is infected by computer virus. e. What is cybercrime? Give any two examples. (i) (523)8 into Binary (ii) (2074)2 into hexadecimal. a. Which of the following is not a network protocol? b. Which of these software is used for photo editing? c. Which device is used to connect multiple networks that uses the same protocol. d. Process of arranging the scattered files into a contiguous manner. a. The physical layout of local area network. b. The business conducted through Internet. c. The law which controls the crime which is done with the help of computer and Internet. d. A computer or device which provides different services to other computers connected to the network. b. What is data redundancy? How can it be reduced in database? c. Mention any four data types that can be used in Ms-Access. a. Which of the following is not accepted by primary key? b. What is called rows in database table? c. Which data type consumes the least storage space? d. Which is the default data type of Ms-Access? REM TO find the factorial of a given number. a) State the purpose of using variable S in line 4 in above program. b) Write the use of MOD in above program. 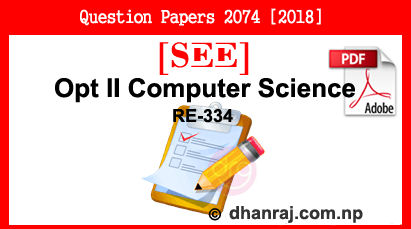 0 Response to "Optional II Computer Science | Exam Paper | 2074  | RE-334 | SEE"